Cloud raved about this, so I figured others might want to check it out as well. I bet that first pic of him without a shirt had the girls "twisting and shouting" back in the day huh Beatlebangs. Last edited by peanut333 : Jan 11, 2012 at 02:57 AM. George was not that muscular. Even though we know that is not George's body, that beautiful face and wavy hair could have people twisting and shouting.He was a tall, lean ectomorph like Lou French's dad, John French Sr. George and his brother Harry get their height from their maternal grandfather. Louise and her dad gave George the bulk of his beauty. George Harrison was too fine for words to do him justice. Dear Lord in heavens does that shirt ever hang nicely on him! George Harrison was a truly beautiful man. 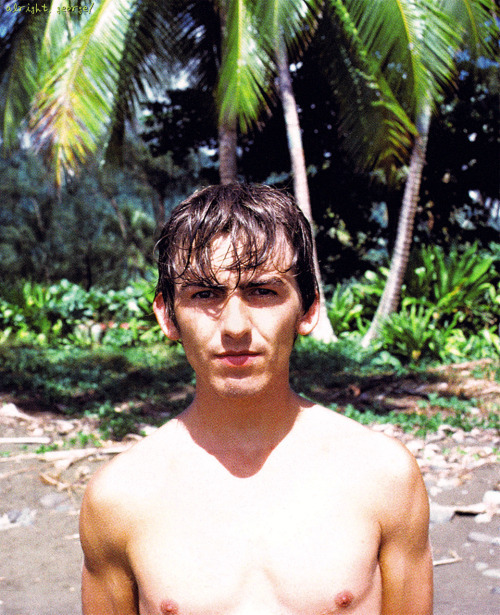 I believe the photos of George in the tropics were taken when he, Pattie, John, and Cyn went to Fiji after filming AHDN in 1964.